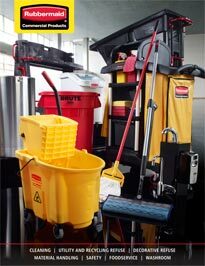 Rubbermaid For Less is your single source for discount, wholesale Rubbermaid Commercial Products. With 32 National Distribution Points to serve you we are your single source for all things Rubbermaid! We have the largest selection of Rubbermaid Trash Cans, Odor Control Products, Rubbermaid Mop Buckets, Tilt Trucks, Rubbermaid Food Service Products, Cleaning Products, Safety Products, Rubbermaid Storage Containers and Rubbermaid Utility Carts anywhere in the world. All orders over $1800.00 ship freight prepaid and orders less than $1800.00 ship via FedEx ground services and/or common carrier shipment. In most cases, you will not be charged more than $90.00 for shipping and handling, regardless of the size of your order. Save today on Rubbermaid Commercial Products at Rubbermaid For Less.